Happy February first! Is it me, or did January pass with a blink of an eye? I actually don't mind as it means we're one month closer to spring. 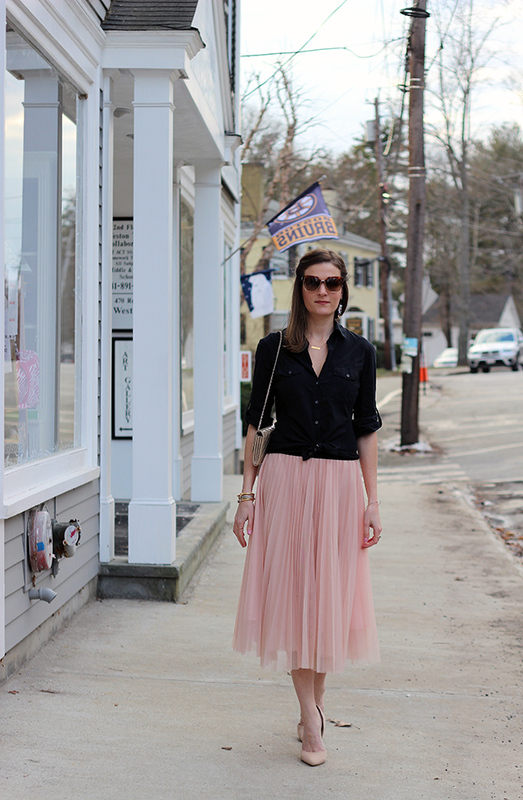 Even though we still haven't had a big snow storm here in Boston, I'm already wanting to lighten up my wardrobe, and this pink tulle skirt is the perfect piece to do just so. I've always loved the look of tulle skirts, and finally broke down and added one to my wardrobe. I admire their femininity, but if you know me, I like to add a bit of edge to my look, so this black button down made the perfect pairing. I knotted the bottom of my shirt channeling my inner Carrie Bradshaw, and finished my look with blush pumps. I'm betting that my black leather jacket will also become best friends with this skirt. Not to mention, this outfit makes a great option for Valentine's Day. Also, there is still time to enter the PinkBlush giveaway to win a $50 gift card. You can enter here. Wishing everyone a great Monday and week ahead. I'm starting a clean eating challenge today, which will last all week. I haven't talked about my fitness and diet here on the blog, but I started eating clean last summer, and have seen many benefits since changing my diet (the main ones include weight loss and increased energy). I'll be the first to admit that I'm not perfect, and love to indulge on the weekends. If I have leaned anything in the past three years it's that life is short so enjoy it while you can. So yes, on the weekends I have pizza, that piece of cake at a birthday party, and I'll never say no to chocolate covered pomegranates (my absolute favorite). Not to mention that there will always be wine in my house. But most of the time I am trying to eat clean and be as healthy as possible. I've fallen off tract after the holidays, but luckily my sister is a Beach Body coach, and hosts free clean eating challenges to get all her clients back on tract and stay motivated. If you're interest in eating clean, or just wondering what it involves, you can follow along on my Snapchat (Rach480) as I'll be sharing my meals and some recipes throughout this challenge. Yes, I was just thinking yesterday how January usually drags, but this year, it just flew by in a blink. 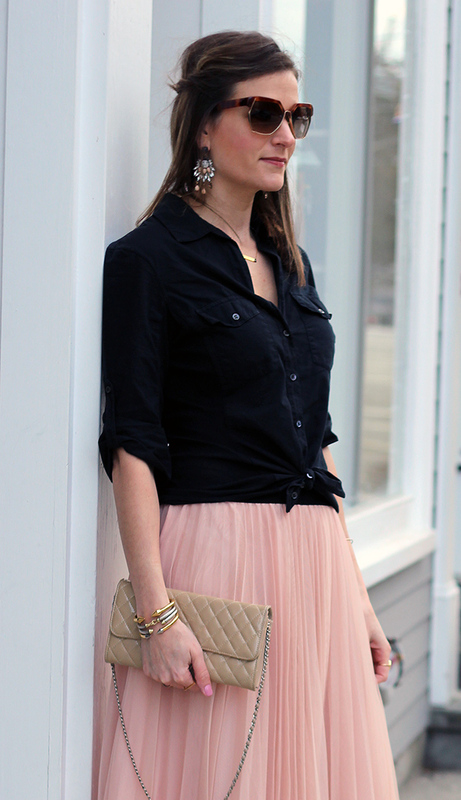 Loving this tulle skirt, especially with the structure and contrast of the black button down. I cannot wait to see this skirt with the black leather jacket. Gorgeous! Totally love this outfit, something I would wear! The blush color skirt is so pretty, makes me want to wish spring is here soon. 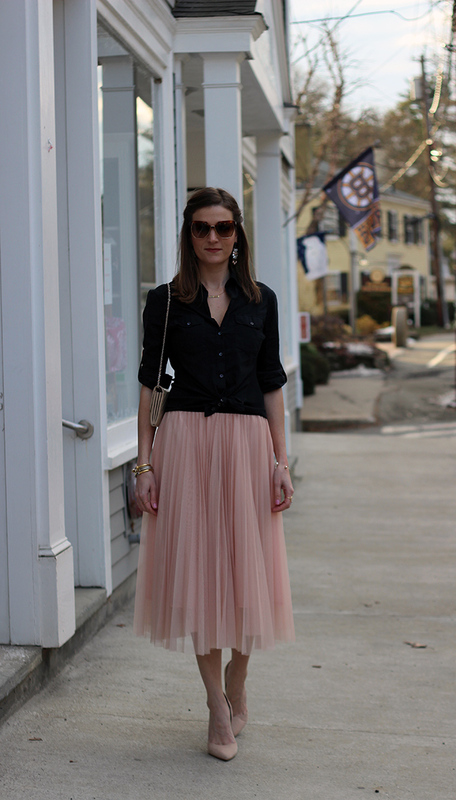 I love this tulle skirt! I also love how you styled it, so it is more wearable for everyday! In love with this look! Perfect for the weather we are having! Can you believe it? Lovely outfit, I love the softness of the color and the pleating. Cute skirt! January definitely went by way too fast! Love your skirt! So pretty & feminine! Ahhh... this is the prettiest skirt I've laid my eyes on!! This skirt is so pretty! I think it would look fabulous with that leather jacket. Beautiful skirt! Looks soo great! Loving this skirt!! I have a blush midi one I got last year, and I wear it all the time! January did seem to fly by, but I'm not sad about it either. I'm the same about eating. I try to eat clean, but I don't shy away from indulging when I want. It's hard to get back on track after the holidays! I'm a sucker for ballerina chic!!! I love how you made a girly skirt look so sophisticated!!! Gorgeous skirt! Loving the color of it as well. I wish January hadn't flown by so quickly, but I am definitely looking forward to some warmer weather! Such a beautiful look! That skirt is perfect! Amazing post dear! I love your photos. Aww, I am interested on eating clean but I do not have Snapchat so when you can, you could e-mail me some tips, thank you.